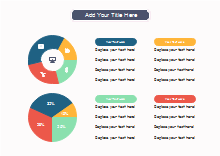 The article will show you when to use a pie chart in details. Pie charts are helpful for doing your work. There is a number of important things you should carefully consider when using pie charts. Pie charts are circular graphs that reflect the related parts of different data groups or categories. Pie charts show users what a fraction looks like on a paper in a good visual representation of different data sets. Every 1% contribution of a part to an overall pie chart corresponds to a 3.6 degree of angle. Generally, pie charts are cut into different sized slices to show specific percentages for each part. In reality pie charts are easy to be abused. You should bear in mind the following important aspects when drawing your pie charts. 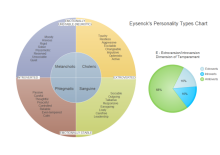 Make sure the parts of your pie chart make up really meaningful concepts as a whole pattern. Otherwise, you should think about other types of charts. Keep in mind pie chart should make sense to your readers in terms of texts. Practical examples of using a pie chart including comparing growth areas for business turnover or profit. You should not make any apparent mistakes by setting exclusive parts, numbers or percentages into your pie chart. If you find overlaps between your figures, try to reset your data or use other types of charts. If you have very similar sized categories, you should be careful with interpretation. It is not suitable to use pie charts to compare between different parts, instead, it should be used for showing the relationship between partial and overall elements. Using a pie chart is ideal for your categorical data groups since every single slice can show a specific category. 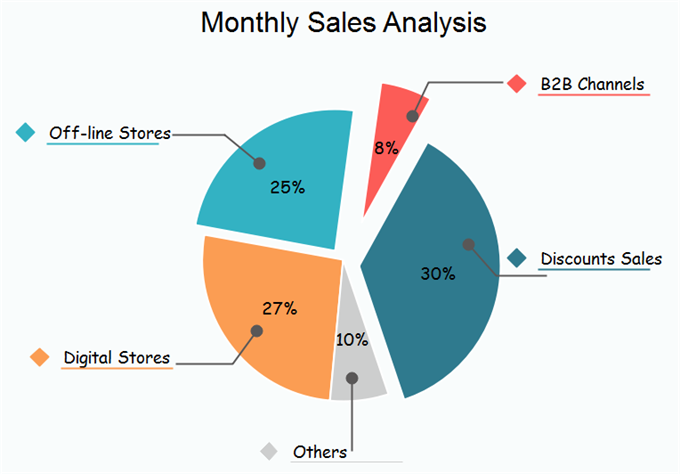 In a pie chart data are classified based on qualitative details such as a type of product. In reality, ordinal data can also be ranked, for example for a consumer survey people may be asked to rank answers based on their personal preference. Normally pie charts are used for no more than six sets of different data. Too many parts will cause difficulty to read so your eyes may not distinguish relativity of size among sections. Pie charts are not typically for negative values. Zero values should also be avoided. Axes are not as apparently shown as other elements in a pie chart, but it is actually the perimeter of the circle that contribute the axis. Try not to use pie charts for showing data trends. Pie charts can be used for displaying minority groups. 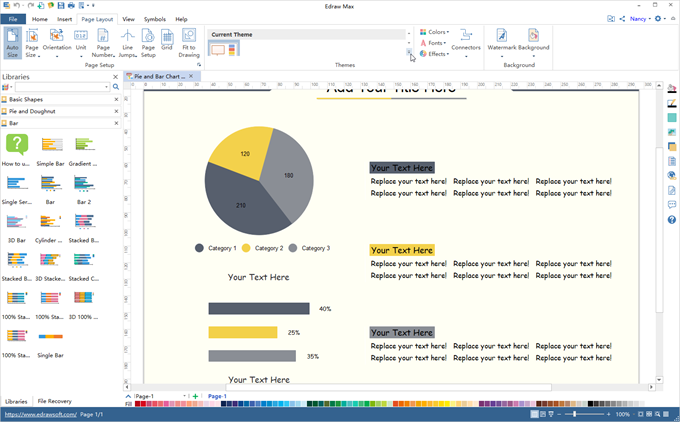 If you pie chart includes a category that does not have any data or values but instead summaries several different minorities, for example, the Other Answers option in a consumer survey, then you should display it in last order even it is not the smallest category in your pie chart. Reason for doing this is to avoid detracting from other data categories. When to Use More Than One Pie Chart? More than one pie chart could be used to compare multiple data categories when you have several different data points with distinguished data details. Usually, in such cases, data groups are identical or similar but have a difference in a specific variable, such as time or age factors. It is very meaningful to keep the same ordering or slices pattern in the second or more pie charts to facilitate comparisons. Be careful magnitudes of slices in your additional pie charts may no longer show the same as in the first one. Using Colors: It is really useful to shade or color different slices in your pie charts from light to dark. This can enhance the data presentation. Avoiding 3D Effects: 3D effects are cool, but you should not consider them in the first place to highlight your data in a pie chart. 3D elements may detract your attention from the important message so you feel hard to compare sizes of different data groups. Also, the use of 3D effects will exaggerate the real influence of your data percentage. 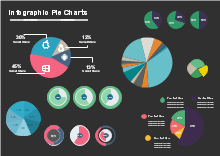 The following free pie chart templates includes the main categories of charts for business and educational uses. Feel free to click on any of them to see more details. The Edraw chart maker has rich built-in chart templates and it offers a highly convenient way to create column, bar, pie, line, area, scatter, spider and gauges charts. It is also easy to import data from local files, or one click set different options like the category and series number, the legend and axis, the axis tick number and category interval etc.